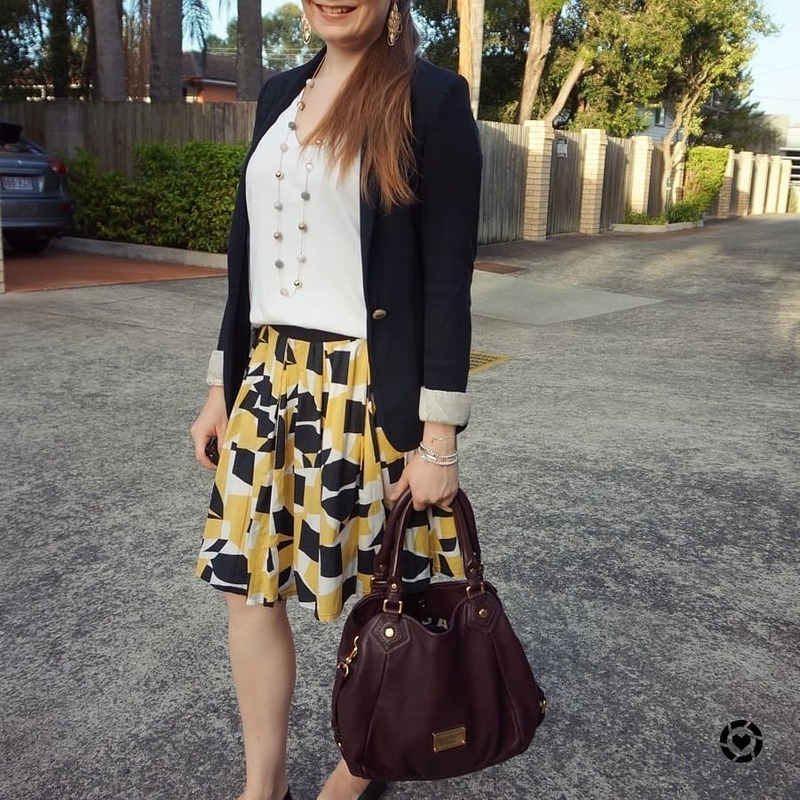 Another Weekday Wear Linkup for you to join, and some office style. As much as a work wardrobe needs classic, neutral basic pieces you can turn to again and again, it's fun to introduce some bolder prints and colours too! 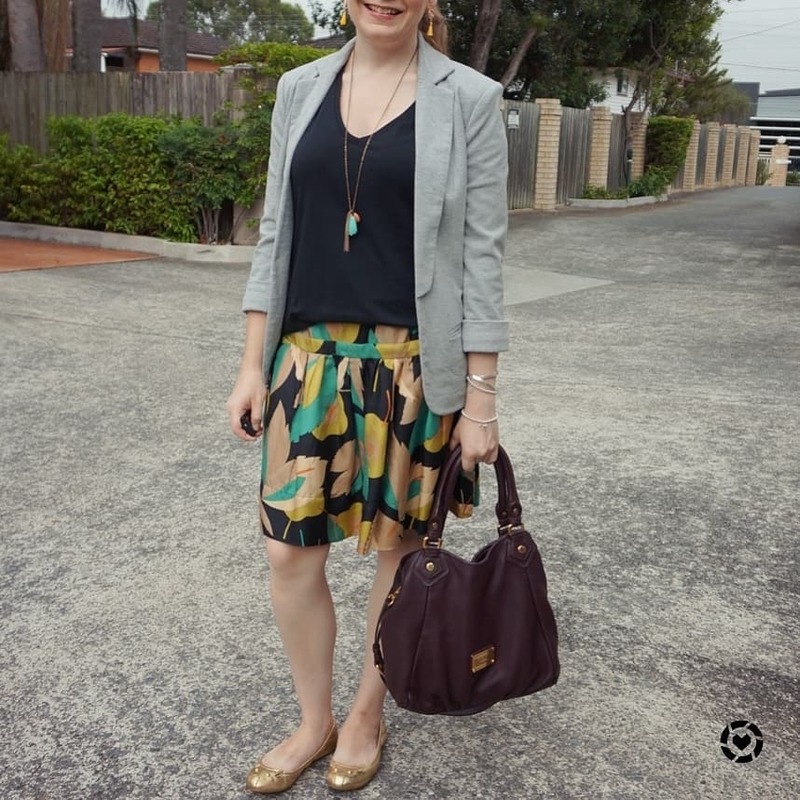 My work wardrobe has certainly changed a lot in the 10 years I've been at my current company, from neutrals and button up shirts to bright colours, statement necklaces and fun prints. The dresses I'm wearing below might be a bit too bold for a more formal, conservative office dress code, but work perfectly in a business causal office like mine. This orange dress is such a bold print and colour but it's perfect for our summer heat as it's linen, and the print disguises creases so it's perfect for a busy day of sitting at my desk in the office! I added the colourful Ruby Olive necklace for a little extra colour, not that the dress needed much! I had another necklace in mind but I thought it was too much, this necklace seemed to work nicer with the orange print and it was a lovely way to remember my friend though the day, as she lost her cat the day before. The Marc Jacobs Fran bag has been worn a few times with this dress, so I tried to change it up a little this time and wore the hair scarf tied in a bow on the handle, just a little point of difference from the last time I wore the dress and bag together. 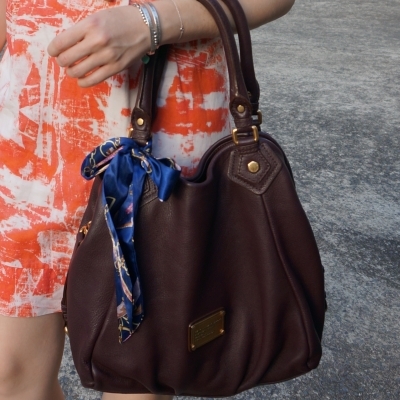 Last worn: Ruby Olive necklace, hair scarf, orange printed dress, silver ballet flats, Marc by Marc Jacobs Fran bag. Other ways to wear: hair scarf tied on wrist, orange printed dress and blazer, silver ballet flats and little black dress, Marc by Marc Jacobs Fran bag and wrap dress. Perfect for pregnancy: orange printed dress hiding an early baby bump, silver ballet flats in third trimester, Marc by Marc Jacobs Fran bag in second trimester. This dress has been in my wardrobe for years, although it's not been as frequently worn as others. You can see the first time I wore on on the blog back in 2012, in one of my early posts! It just goes to show that animal print will always be a classic you can pull out year after year. 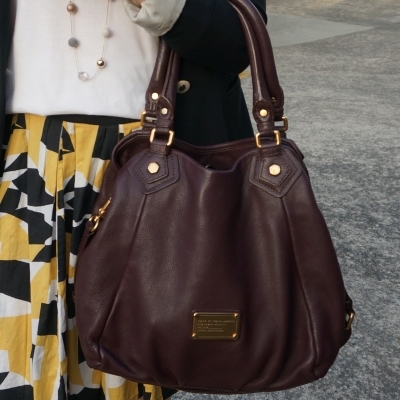 It's not the first time I've worn this dress with the Marc Jacobs Fran bag, they have been a frequent combination over time, as I think the carob brown of the bag works well with the neutral colours in the print. With the camel flats too, I thought the outfit needed a little touch of colour with all of the neutrals, and this yellow statement necklace was the perfect touch. 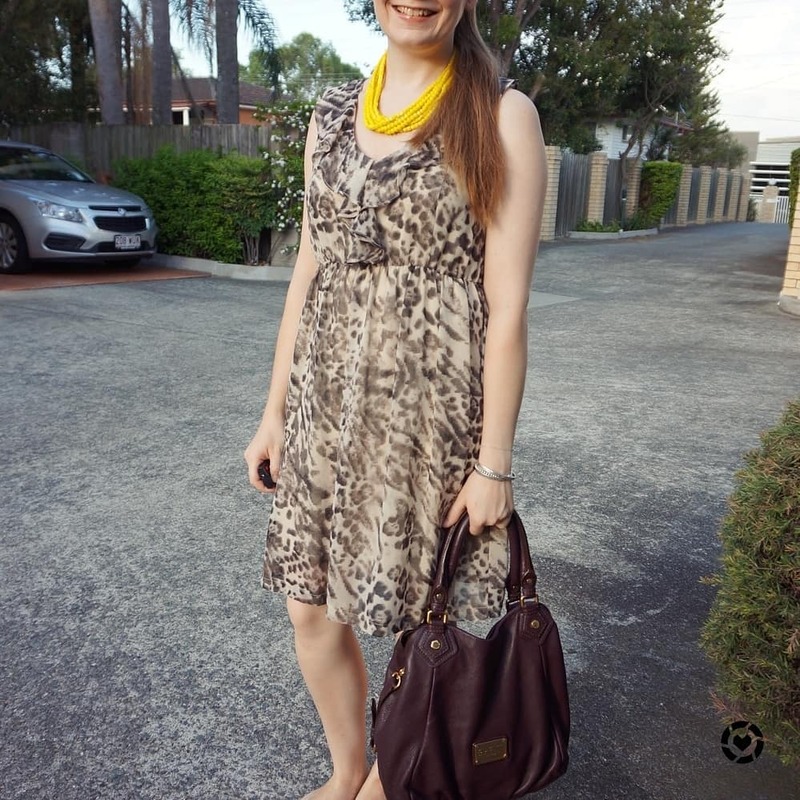 Last worn: yellow beaded necklace, leopard print dress, camel flats, Marc by Marc Jacobs Fran bag (above). Other ways to wear: leopard print dress and blush blazer, camel flats and wrap dress, Marc by Marc Jacobs Fran bag and burgundy pants. 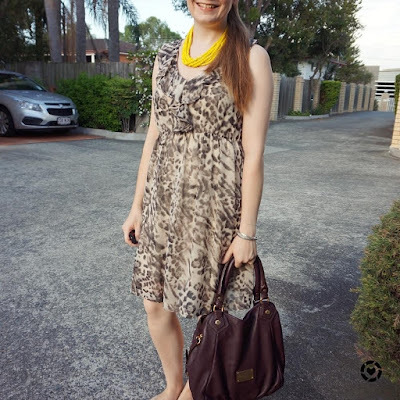 Perfect for pregnancy: leopard print dress hiding second trimester bump, camel flats in third trimester, Marc by Marc Jacobs Fran bag in second trimester. A printed dress is such a fun office piece. You can pair it with neutral shoes and a bag to tone the print down, or cover it up a little more with a blazer if you are worried it might be too bold for your office environment. 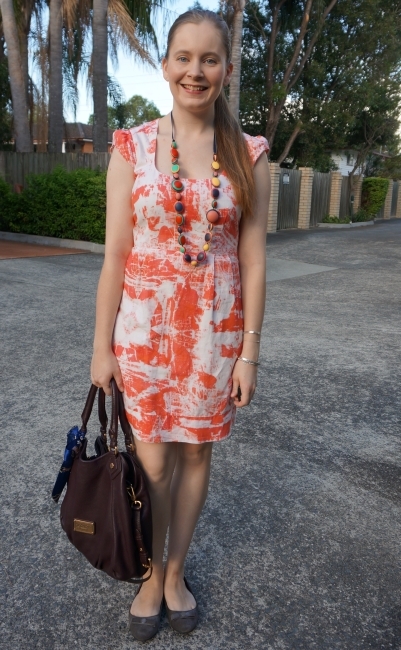 Alternatively, you can maximise the print with colourful statement necklaces and bolder handbag and shoe choices. 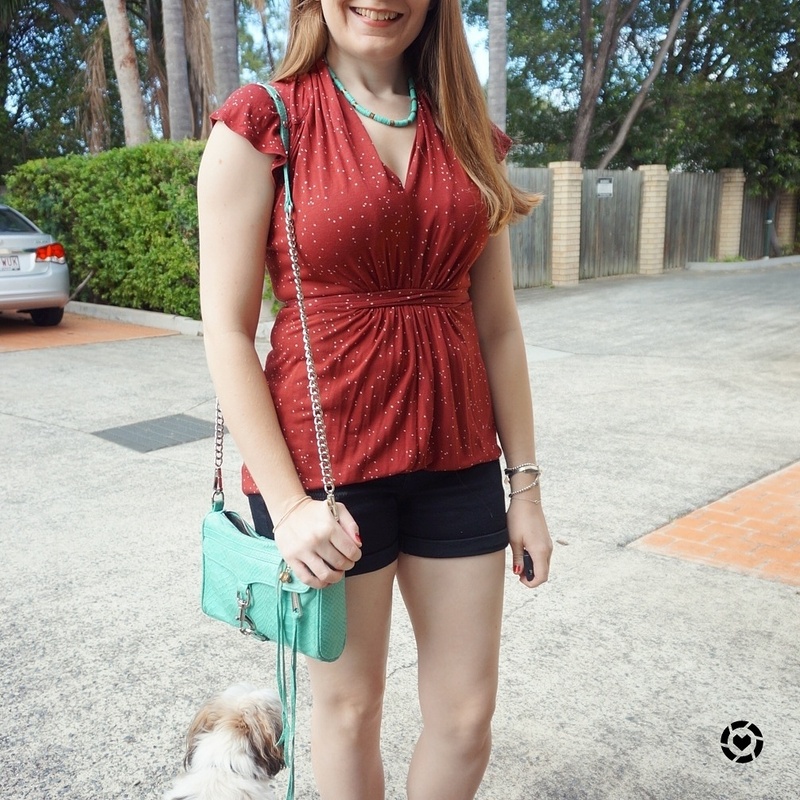 Linking up with Confident Twosday, Trend Spin, Turning Heads, Style Sessions, Fashion Frenzy, Style On The Daily, Oh Hey Girl, Thursday Moda, Fashion Files, Chic and Stylish, Trendy Thursday. My blog friend Ruth does these 5x5 style challenges on Instagram. Another blog friend, Eileen and I started talking with her about it and thought it would be fun to participate. We decided to do an international style challenge a couple of weeks ago near the end of November. The rules: 5 pieces of clothing to create 5 outfits over 5 days, with a black and burgundy colour scheme. Accessories like shoes, necklaces, scarves, handbags, outerwear, can be added as needed and don't count as one of the 5 pieces. Who took part: Ruth @ruthyannie, Eileen @eileensed and myself, @awayfromblue. Ruth did this over autumn in the cold weather, and Eileen had to dress a growing baby bump too! I have so much admiration for them both! 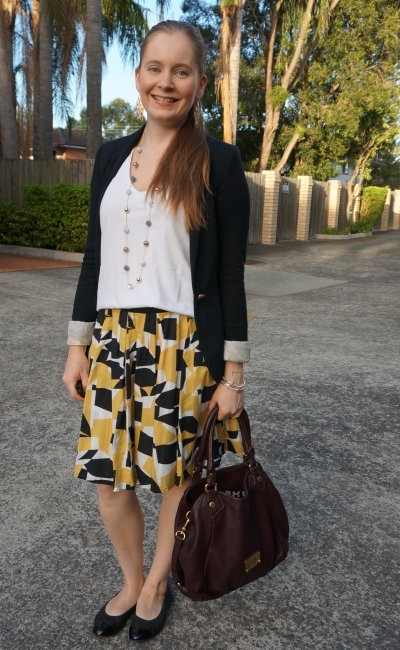 This is going to be a bit of a long post as I share with you what we wore over 5 days! I hope you'll get a lot of outfit inspiration from it though, and discover some new ways you can rewear pieces you already own. After a few last minute swaps and changes, these are the 5 pieces I came up with for the challenge. My choices were limited by the colour scheme which helped me make decisions about what to pick as my 5 pieces. 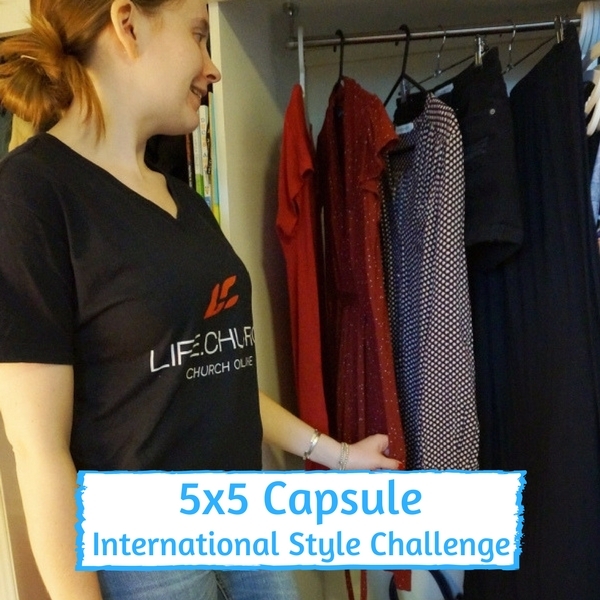 The last time I did a capsule, it was my third trimester capsule wardrobe and the growing bump helped limit my options there too! I did have to go into the office for one day which made me pick the shirt dress, even if the print is more red than burgundy. I figured it was close enough! The main worry I had was around structuring the pieces I wore to allow me to have them washed and ironed ready for the next wear With two messy toddlers it was highly unlikely I was going to be able to wear things twice in a row without washing them! In the end I came up with 6 outfit ideas so that if something wasn't ready in time, I'd have a fall back option. For the first day of the challenge I went with a classic tee and maxi skirt combo. When I'd first started planning outfits and pieces for the challenge I'd went with a different burgundy tee, and changed my mind and swapped it for this tee instead. I didn't like the way this one sat with the maxi skirt though, I was a bit frustrated with it both tucked and untucked and wasn't as comfortable with this outfit as I could have been. Easy outfit for playgroup though. 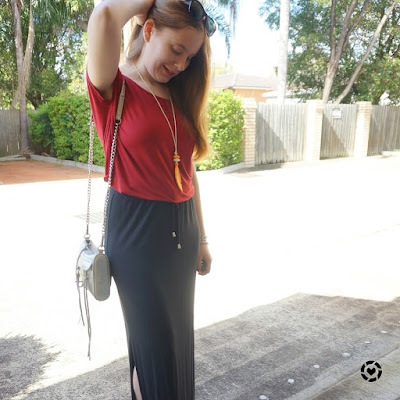 Last worn: burgundy tee, black maxi skirt, black ballet flats, Rebecca Minkoff silver mini MAC. Other ways to wear: burgundy tee and navy kimono, black maxi skirt in autumn, black ballet flats and pencil skirt, Rebecca Minkoff silver mini MAC and printed jeans. Perfect for pregnancy: burgundy tee in first trimester, black ballet flats and maternity wrap dress, Rebecca Minkoff silver mini MAC and maternity shorts. This was as 'formal' as my outfits got during the challenge, the majority of them were casual outfits. I had to go into the office, so picked this shirt dress to fit in with the business casual dress code. I found myself fussing with this outfit too during the day though, the dress seemed to ride up a lot and I was constantly tugging it back down. I much prefer wearing this dress as a kimono, or layering it up with tights in winter. I knew with the darker black and red print on the dress (it's a geometric print although it looks like polka dots in the pics!) that this Marc Jacobs bag would work perfectly with it. This bag doesn't get worn as often as it did when I first got it, but it's still a nice choice for work. It's been tagged in 62 posts on the blog and most of the time it featured in both outfits of the posts, so you can see it was worn a lot in the past! Such a unique colour too, a deep purple-y brown. 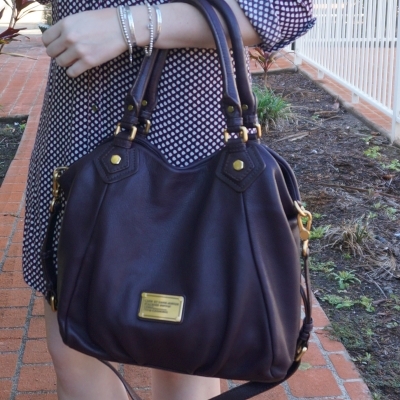 Last worn: geometric print shift dress, black ankle boots, Marc by Marc Jacobs Fran bag. Other ways to wear: geometric print shift dress layered for winter, 30 ways to wear black ankle boots, Marc by Marc Jacobs Fran bag and maxi skirt. Perfect for pregnancy: black ankle boots and pregnancy announcement, Marc by Marc Jacobs Fran bag at 40 weeks pregnant. The simplest of all my challenge outfits, and also the most popular. I wore this to work from home and attend a specialist appointment with baby boy in the afternoon. 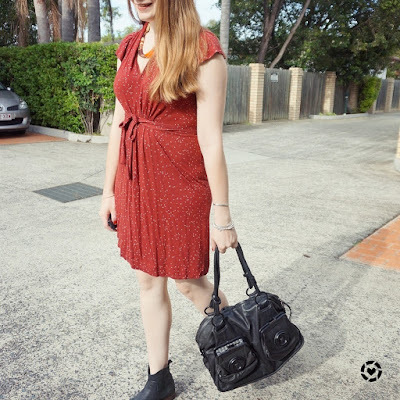 With the burgundy star print dress, I added black through my accessories, with the same ankle boots I'd worn the day before and another little worn bag, my Mimco button bag. This was actually my first expensive bag purchase, despite how little I wear it now I'm never going to let it go. I spent months thinking about it and saving for it and picking out the perfect colour combo I wanted and I still remember the excitement of going to the store to pick it up! Very treasured even if not frequently worn now. I think I bought it in 2007 at the height of the button bag trend, still looks great. 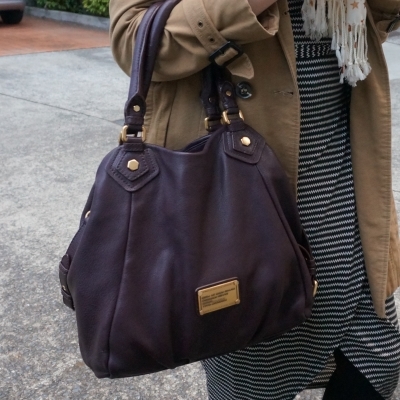 Sadly it's discontinued, the closest thing is the Mimco Turnlock bag that's around $200 more expensive than the button bag was 10 or so years ago, or to go to ebay for the classic style. 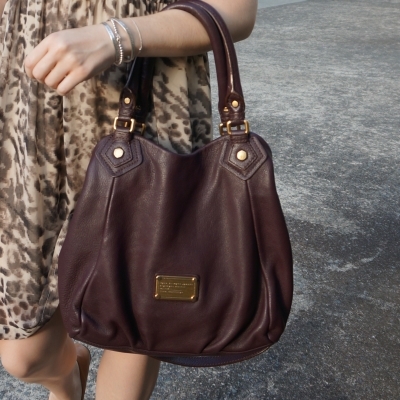 Last worn: burgundy star print dress, black ankle boots (above, day 2), Mimco button bag. Other ways to wear: burgundy star print dress in third trimester, black ankle boots and skinny jeans, Mimco button bag for the office. Perfect for pregnancy: burgundy star print dress for travel in Melbourne, black ankle boots in second trimester. An incredibly busy day called for a comfortable and casual outfit, and the first wearing of the last of my 5 pieces, my black denim shorts. Added the comfy slouchy burgundy tee and the printed dress was worn as a kimono. Converse were a practical choice for a busy day, and the mustard yellow bag was a fun touch of colour with the black and burgundy. Baby boy had some more tests at the hospital in the morning, so I had the day off. With my mother in law available to watch the boys, as it was a day I normally work, I made the most of it and she looked after them both once the testing was done so I could gt a rare child free afternoon to go Christmas shopping. And I shopped up a storm, getting the majority of the things remaining on my Christmas present list! Last worn: shirt dress as a kimono (day 2), burgundy tee (day 1), black denim shorts, Converse, Rebecca Minkoff micro Regan bag. Other ways to wear: shirt dress and ankle boots, burgundy tee and skinny jeans, black denim shorts and stripes, Converse and skinny jeans, Rebecca Minkoff mustard micro Regan bag and red maxi skirt. Perfect for pregnancy: burgundy tee in first trimester, Converse in the second trimester. For my fifth and final outfit with my 5 pieces, I wore my denim shorts again and the lovely burgundy dress as a top. 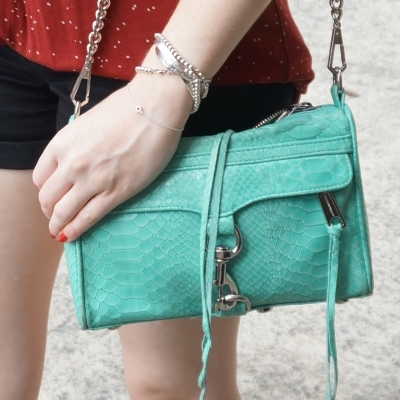 I added turquoise accessories with the necklace and Rebecca Minkoff mini MAC bag for an extra touch of colour. I've won dresses as tops before, it's a nice way to wear something a little differently. The extra dress fabric wasn't too bulky although it was a bit of a pain tucking it in to the shorts every time I went to the bathroom! I had considered doubling up on the dresses and wearing the shift dress as a kimono over this again, but despite how little time I spent with the boys the day before it still got messy and had to have a wash. That was the hardest part of this challenge - making sure everything was washed and ironed in time to wear again! This was a nice outfit to finish the challenge on, I ran around with the boys completing a few errands. Last worn: burgundy star print dress (above, day 3), black denim shorts (above, day 4), Havaianas, aquamarine mini MAC bag. 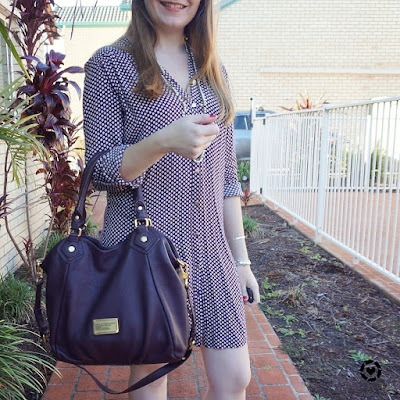 Other ways to wear: burgundy dress layered for winter, black shorts and polka dots, aqua mini MAC bag and maxi dress. Perfect for pregnancy: burgundy dress and second trimester bump, aqua mini MAC bag and maternity shorts. Hope you enjoyed seeing the different outfits we were able to create for the challenge. While it was a fun challenge for me, I was looking forward to getting back into my regular wardrobe at the end of it! Especially after buying lots of new pieces that month that I was eager to wear. Thanks so much to Ruth and Eileen for inviting me to take part - if you don't already, you should follow them on Instagram! 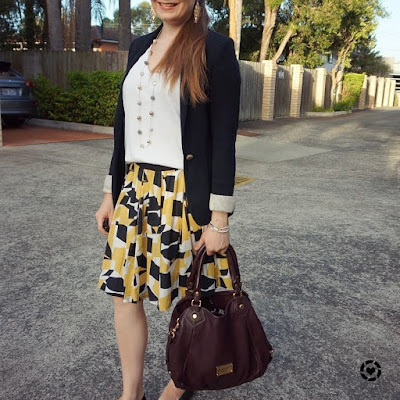 Linking up with Passion for Fashion, Mix It Monday, Hello Monday, On Mondays We Link Up. It can be difficult finding affordable, stylish and professional breastfeeding friendly clothes! If you're returning to work while your baby is small you may need to find things you can wear that allow you to express breast milk through the day. While I've expressed breastmilk for my babies at home and when out and about (like at a wedding! ), I haven't had to express in the office or negotiate any pumping breaks during my day. I do know from my experiences outside the office that these outfits would work perfectly for expressing. They are ideal for attending and facilitating meetings too. One more thing to note before I get to the outfits is that you have legal rights in Australia that allow you to continue to work and breastfeed - you can read more here to find out how to get the support you need to return to work while breastfeeding. "It is generally against the law to refuse to make arrangements to assist you to breastfeed at work, if these are reasonable". Your rights in more detail. This dress is one of the handful of pieces I've bought that failed the 'wear twice in a month after buying it' rule. I bought it while on maternity leave, not wanting to pass on the sale bargain and knowing I'd get a lot of wear out of it when I returned to the office. I do like wrap dresses for easy breastfeeding, but this one seemed a little out of place in summer when I wore it and so it was put aside until my return to work. This is only it's second wear now, 7 months after I bought it! Glad I bought it though, it is perfect for the office. I layered a colourful tank underneath but you can't really see it with all the layers on top! 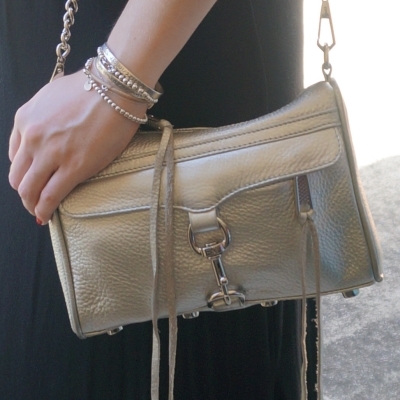 Really enjoyed wearing this, and I enjoyed getting out this Marc Jacobs Fran bag again too. It only really gets worn to the office so it's been a while since I've worn this too, over a year and a half! 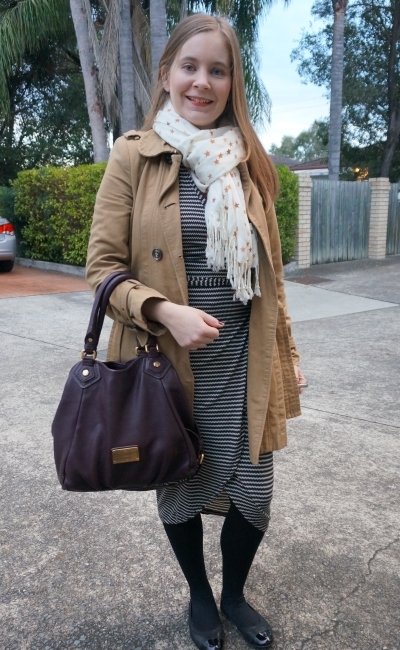 Last worn: camel trench, star print scarf, zig zag print wrap dress, Walnut Melbourne Ava ballet flats, Marc by Marc Jacobs Fran. Other ways to wear: camel trench and pencil skirts, star print scarf and skinny jeans, zig zag print wrap dress worn outside the office, black ballet flats and printed jeans, Marc by Marc Jacobs Fran and skinny jeans. Perfect for pregnancy: trench coat and hidden first trimester bump, star print scarf and second trimester bump, black ballet flats and maternity pencil skirt, Marc Jacobs Fran bag in second trimester. Unlike the wrap dress above, this one has been worn quite a few times since I bought it while pregnant. Even though I bought it a size larger than normal to accommodate a growing baby bump in my final trimester, being a wrap dress it still fits nicely without the bump. Decided to go with the blue coat, scarf and tank underneath too. I like all the blue with the turquoise print of the dress. I didn't feel quite as confident in this dress as I did in the same one with a different print above. Only because I kept stopping to realise through the day that the last time I'd been in the office with this dress I was pregnant, and it made me miss my boys. Hopefully it will be easier next time I wear this dress, I'll spend less time caught in my own thoughts. Returning to work is an emotional time, compounded by baby boy not adjusting to the change well and having disrupted sleep. 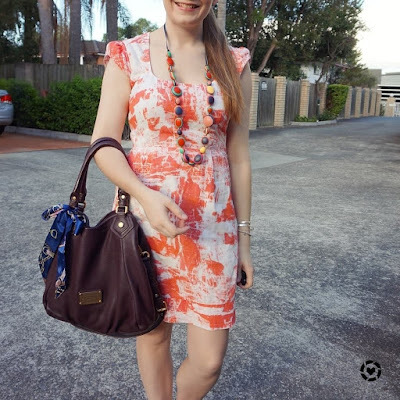 Walking into a meeting room, or the lift, or the kitchen, or sitting at my desk and realising last time I did those things in this dress I was pregnant made it a bit of a tough day to get through as my boys were always at the forefront of my mind. 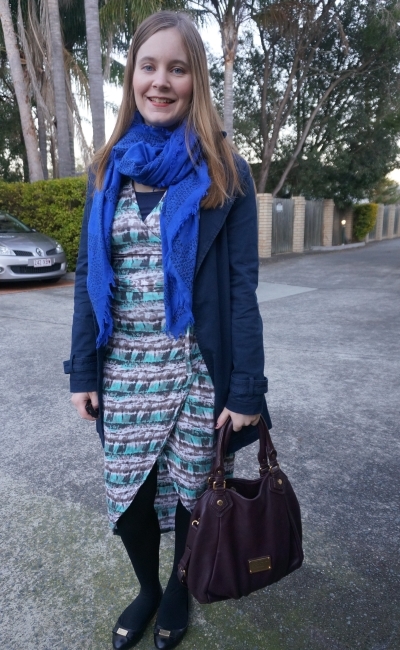 Last worn: navy mac, cobalt scarf, navy tank, printed wrap dress, black ballet flats, Marc by Marc Jacobs Fran bag (above). Other ways to wear: navy mac and chambray dress, cobalt scarf with monochrome maxi skirt outfit, navy tank and printed shorts, printed wrap dress and ankle boots, black ballet flats, Marc by Marc Jacobs Fran bag and burgundy pants. 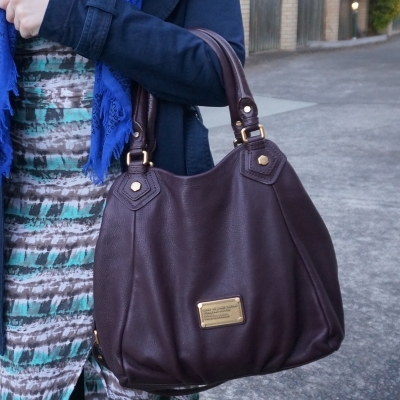 Perfect for pregnancy: wrap dress in the last trimester, Fran bag at 40 weeks pregnant. A wrap dress is a classic wardrobe item that a lot of people have. They are timeless, suit so many different people and are usually pretty affordable. The wrap detail makes access for breastfeeding easy, and it's this feature that makes them a good dress choice for anyone who has to express too. You can easily layer a breastfeeding singlet underneath, or quickly slip them off to put on a pumping bra instead if you have one. A wrap dress can make you look and feel good, meet corporate office dress codes and work for you if you're returning to work and breastfeeding or expressing. Linking up with On Trend, Turning Heads, Confident Twosday, Style Sessions, Style File, Fashion Frenzy, Style On The Daily, Oh Hey Girl, Thursday Fashion Files, On Trend.